It’s hard to describe the feeling of being able to cool down and relax under a superb and functional ceiling fan. However, if you are searching for the best ceiling fan, make sure you end up with a top-quality product. I hope this website will be your last stop before you decide to invest in a ceiling fan for your home. Whether you are looking for a ceiling fan for the first time or you are thinking about replacing an old fan, everything you need to know about ceiling fans is right here. We have included a diverse range of products to ensure that all your needs are addressed. My advice is to browse through this list of ceiling fan reviews and select the one that best fits your needs and style or you can view our top rated ceiling fan guide below. You will be sure to find something that fits your home perfectly. If you are looking for something very special, check out our ceiling fan type article where we discuss the various different ceiling fan types available to you. You might be looking for a ceiling fan with lights or the best rated outside ceiling fan. What ever you need, go ahead and read my list of top ceiling fan products to discover the one that’s made for you. Do You Need a Remote? Outdoor or Indoor Ceiling Fan? How to Spot a Quality Ceiling Fan? The first item on the list is the excellent L Series from Haiku Home. This ceiling fan is beautifully designed, with a stylish look and extremely quiet operation. You have the option of a black or white unit. This fan will provide you with everything that a ceiling fan should, with some extra bells and whistles thrown in. It comes with a primary wall control that enables you to turn the lights and the fan on or off. However, if you want more luxury, you can invest in the so-called SenseMe wall control at an additional cost. The SenseMe technology is a handy add-on for turningon/off the fan or lights automatically when you enter or leave the room. Moreover, it responds to humidity and temperature change and will automatically adjust to your comfort level, all while saving energy. Then again, if you settle for the included basic wall control, you will still be able to control the speed of the fan (from 1–7) and the brightness (from 1–16). Furthermore, you will be able to operate an Automated Schedule Mode that lets you set the fan speed and lights to be turned on at a particular time. Overall, this is one of the most popular ceiling fans on the market today. The LED is extremely bright at its max but dimmable, and the included remote control does exactly what it says on the tin, so you won’t have to deal with any pull-chains to adjust the fan or lights. This fan will be a great addition to your home if you are looking for a modern, stylish, and energy efficient ceiling fan at a very reasonable price. Our next item is the F844-DK Distressed from Minka Aire team. Here we have a high-quality ceiling fan that will cool down a large room in any home. It has a beautiful wooden design and includes an efficient motor that comes with a lifetime warranty. The motor is very powerful and can reach speeds of up to 6580 cubic feet of air per minute. In order to maximize air efficiency, you will receive an integrated, LED light fixture that you can dim. You will be able to reverse the direction of the blades but bear in mind that there is no reverse mode option on the fan. Moreover, you’ll need to invest in a down-rod before you mount the fan to your ceiling because it is not included in the package. All in all, this unit is a quality ceiling fan, composed of hard-pressed Koa wood that results in a beautiful design and feel that will fit perfectly, as a gorgeous decoration, in any room. It consists of three massive blades that get a lot of air moving, and you will also receive a user-friendly remote that enables you to adjust the speed and brightness to according to your comfort level. The strong and efficient blades are built to move around 6580 cubic feet of air per minute. With that high capacity, you might expect your energy bills to sky-rock, but rest assured this unit is Energy Star certified. If you are looking for an energy efficient but powerful ceiling fan that would be a beautiful addition to any home, then have a look at the F844-DK and see if it fits your lifestyle. This brilliant small fan from Savoy House really moves the air. It operates on 37 watts at maximum speed and provides 64 cubic feet per minute per watt of airflow efficiency at high speed. Moreover, you will enjoy 2374 cubic feet of airflow per minute at maximum speed. As you can see from the pictures, this fan is very aesthetically attractive. Current owners love the design and agree that this fan features a unique lighting fixture and eye-catching style. Here we have a great ceiling fan that moves the air efficiently and will add a charming retro feel to any room. An important thing to note is the power of the light is not as you would expect. This unfortunately won’t light up a big room with the given light bulbs. However, it does provide a pleasant, cosy ambience and users are thrilled with the dimming function. In general, this ceiling fan is very modern looking, silent yet powerful, and features quality craftsmanship. The installation should not take too long but bear in mind that this is a heavy unit and takes at least two people to get the job done. You will receive a fan with three chestnut blades and a motor that operates on 120 volts. It requires one bulb (included) and a remote control that enables you to operate three different speed levels and up-and-downlight dimming as well. It also includes a 4.5-inch pole for mounting, and on top of that, your purchase is backed up by an industry leading one-year warranty. Here we have the 56-inch Casa Esperanza from Casa Vieja that brings together a modern-day artistic and stylish design and an efficient motor. It provides an extraordinary level of airflow circulation with top-rated energy efficiency. With the Casa Esperanza ceiling fan, you will reduce your electricity bill significantly because of the quality design of the blade system, and the quiet motor will both work smoothly to keep the air circulating efficiently and maintain room temperature. The package includes five bronze and gold quality constructed blades. The height of the fan is 15.75 inches (ceiling to the blade) and 22.05 incheshigh from ceiling to the bottom of the light kit. Thedownrodis 4 ½ inches long,and the canopy measures 2.4inches high and 6.3inches wide. If you take into account the benefits, quality, functionality, and the price-tag of this ceiling fan, it is clear that this item is a fantastic solution for your home. Current owners are thrilled with their purchase, and the Casa Vieja production team has done a great job in providing a top rated ceiling fan that fits perfectly in most rooms. Also, in the unlikely event that you don’t want or don’t like what you received, you can always return it using the hassle-free one-year warranty. Moreover, what current owners love about the Esperanza ceiling fan is the fact that the motor is backed up with a lifetime warranty and that is a warranty that only top-rated sellers include today. It has everything you need in a ceiling fan: 14-degree pitch with blades spanning 56 inches. It comes with a wall control and includes a four-light kit that will take two 50W mini halogen light bulbs. Have a look at the Esperanza ceiling fan if you are looking for a stylish and budget friendly ceiling fan that is designed to fit your style and needs. Next up is one of the more popular Hunter ceiling fans on the market today. Current owners are thrilled with their Hunter 53237 and this is one of the top-rated and budget-friendly ceiling fan that you can get your hands on. The Hunter Company is famous for its superior quality ceiling fans and this unit is no exception. It features 52-inch blades that provide an impressive cold airflow and you can choose between three beautiful colors and light fixtures (with three bulbs included) to ensure that this fan will fit perfectly in any room into your house. As with any modern ceiling fan, you are likely looking for a silent unit. Who likes a noisy ceiling fan that will disturb you during daily activities or when you have friends and family over? Of course, the Hunter Builder Plus incorporates its WhisperWind technology that results in a silent motor. You’ll be able to set three different speeds ranging from low to high and you can also set the motor to run in reverse. All these settings can be controlled using a Hunter remote control (sold separately) or via the pull-down chain. The painless setup process is a primary quality of all Hunter ceiling fans. Therefore, this fan features a hassle-free three-step mounting. 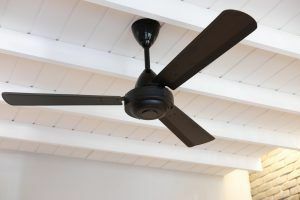 With some variation depending on what type of ceiling you are mounting it on, generally, installing this fan allows anyone to mount the fan with standard or angled mounting techniques. Not only is it extremely easy to mount, but it is also energy efficient like every Hunter ceiling fan. Low wattage along with the silent motor and 52-inch blades ensures maximum performance, even in large rooms. Overall, this fan has so many qualities to list. It is extremely durable, easy to install, dust resistant, silent, lightweight, and you can customize the speed to your convenience. On top of all these great features, Hunter stands by its products 100% and offers a limited lifetime warranty to ensure that you end up with a top-rated product. Next up is the Hunter 53090 Deluxe edition and this one comes with an elegant concept, reasonable price, lifetime motor product warranty, and straightforward mounting, all on top of silent motor performance. This fan will bring a stylish look into any room in your house, and the dimmable LED lights makes it an attractive decor choice. The Hunter Deluxe is packed with impressive features. One of many eye-catching details is the beautiful white light bowl. It also features WhisperWind technology; three-speed motor that delivers silent operation, even at maximum speed. You won’t have to worry about emptying your for a new motor if it fails, as Hunter provides a lifetime warranty. You should be able to mount this fan into a big room, up to 400 square feet. This fan is extremely powerful and provides 5110 cubic feet of air-flow capacity and 64W (120volts). Rest assured, the installation process is easy to install and you can make use of the three-position mounting system that consists of a standard mount, flush mount, and angled mount. You can also check out our ceiling fan installation guide for more info on that. The package includes five 52-inch sturdy, reversible blades. You can select from three different textures:white, cherry oak, and brushed nickel. If you are looking for a nice pull-chain fan with a stylish modern look and easy installation, then I suggest you look no further than the Hunter 53090 Deluxe. You can’t go wrong with a lifetime warranty on the motor, plus an extra one-year warranty on the whole product itself. Here we have a budget-friendly, reversible, and powerful but silent motor that does exactly what it is supposed to do: provide powerful air movement! Up next is a product from Minka — not the most famous ceiling fan manufacturers, but with this unit, they are making their mark on the fan industry. Here we have the ideal ceiling fan for those who are looking for a unit to mount in a room with a low ceiling as this fan only sits 10.5 inches from the ceiling. Current owners agree that the Minka is beautifully furnished with an innovative appearance designed to meet any space. As you can see from the pictures, the Minka features a simple and practical metal concept. It comes with three blades that are built to move and rotate the air efficiently. Moreover, you can even add more style to the decor by using the center light. If you decide to use the halogen light, you will be pleasantly surprised by how powerful it is. You control the illumination with the included control, and you can dim or lighten the room as you wish without getting up. Furthermore, you can set the speed (three-speed settings), turn the fan on or off, dim or brighten the light, and activate the reversible feature, all by using the remote control. Owners that bought the Minka Aire are thrilled with their purchase and it is hard to find anything negative about this fan. This is one of the most popular units on the market. It has everything that you need in a fan and it looks magnificent, comes with three durable blades, reversible motor, and a controller. The reversible operation is brilliant and you can use it all year long, depending on your needs. During winter, you can use it to move warm air from the ceiling and circulate it. During summer, you can use it to draw in cold air to circulate the room. It’s also energy efficient and can be used in combination with air conditioning to circulate the cold air around the room. Current owners did mention that it is hard to install and mount this fan. Therefore, if you are not experienced at DIY, it is recommended that you hire a professional to mount the unit on your ceiling. At last, if you are on the look-out for a beautiful, aesthetic design that will cut down your electricity bill with its Energy Star rating, then check out this affordable and stylish ceiling fan and see for yourself if this is something that fits your style and needs! Here we have a contemporary designed fan from the famous company Emerson. This model has 54-inch, vintage steeltexture and reversible oak blades with a built-in light in the centerthat holds two 50W halogen bulbs. This fan is sure to inspire any vintage industrial space. The package includes three blades with a 54-inch blade span, two downrods (6inchesand 12inches), a light with two halogen lightbulbs, and a four-speed control with a receiver. There are some limitations on where you can install the Emerson, and this model is listed for indoor use only. It is not designed to be exposed to extreme weather elements. This also means that it should not be installed in laundry rooms or bathrooms because this unit is sensitive to moisture. However, it has a neat industrial vintage look that is increasingly popular nowadays. Emerson is famous for its quality constructed products, and this unit is no exception. It is one of the most popular units on the market today and, like with everything, you get what you pay for. This model is not the cheapest brand, but one of the highest rated fans in the business. It includes great assembly instructions to make the installation process very easy. Once you open the package, you assemble the entire fan before hanging it. Thanks to its streamlined blades and quality built motor, there will be no wobble at all, even at the highest speed. The fan will remain completely stationary and quiet at max speed, rotating a powerful amount of air. Have a further look at the Emerson if you are searching for a vintage, industry style and effective ceiling fan. Our last item on the list is the fantastic VE58SS3 from Craftmade fans. Of all the ceiling fan reviews, this is probably the most efficient unit on the list. It includes three blades and measures 12.25 inches from ceiling to bottom of the fan. The downrod is included and measures 12 inches. If you need a longer downrod, you can purchase it separately. The distance from ceiling to blade is 18.5 inches, and the diameter of the canopy is 4.75 inches. The package includes a remote control with four speed levels, and the fan is controlled by a silent motor that rotates the air continuously to maximize the airflow in the room. Bear in mind that this is not a unit with a reversible AC motor. The installation is a relatively easy process, and it can be mounted on either a flat or angled ceiling (up to 21 degrees) and to maximize its lifespan, it is recommended for indoor use only. The motor is extremely powerful but silent during operation. It provides airflow well above the average at a massive 7.731CFM. You might think that a motor with that power would be noisy but in fact you will only hear the wind circulating. This model is available in three different textures, and if you are looking for a quality built, efficient, and highly rated ceiling fan that won’t break the bank, the Craftmade could be for you. Our tenth item is the Hunter Bridgeport Ceiling Fan (HU-53126). This is a cost-effective fan with a bronze texture and quality built oak blades. This fan is the perfect solution for either indoor or outdoor use. It doesn’t matter if the location is dry or humid, the fan will operate flawlessly in any situation. This is one of the very few ceiling fans that’s approved for outdoor use, which says a lot about the quality of this fan. You’ll receive a unit that features a 12-degree blade pitch and provides an official airflow rating of 4, with 5 being the best possible rating. To control the speed, the fan is operated by a three-speed pull chain. Although this fan does not receive the optimal 5 air-flow rating, it will still cool down any room or porch/patio. Moreover, it is one of the best ceiling fans for outdoor use that won’t break the bank. The weatherproof blades are guaranteed to withstand any weather conditions, but to maximize the lifetime of the fan, you should cover it during the dark winter months. Not only is this one of the few models you can use outside, but it is also one of the few models with a reversible motor that will allow you to change the direction of the blades. That way, you will be able to select downdraft mode or updraft mode depending on your preferences and comfort level. You’ll be able to choose from three speed settings and the blades operate on an ENERGY STAR regulated silent motor. This silent motor provides quiet operation and delivers the refreshing air power that you desire, and all without the noise! Here is a cutting-edge 42-inch ceiling fan that is a perfect match for smaller rooms up to 100 square feet. Inside is a heavy-duty, dual capacitor silicon steel motor that can be set to run on high, medium or low speed. Moreover, it comes with a switch that allows you to reverse air flow. That way, you can set it to spin counterclockwise during summer time and switch to clockwise direction during winter. This unit is extremely efficient, provides 2897 cfm airflow and uses 53 watts (without light) that results in 55 cfm per watt. It also comes with a down rod along with two 40-watt light bulbs. On top of that, there is a lifetime warranty against defects on the motor and two-year warranty on all other parts. This ceiling fan would be an excellent choice for a bedroom or home office. Additionally, this Westinghouse ceiling fan can be mounted on high ceilings, standard ceilings or low ceilings. For high ceilings, it is important to install it with an extension down rod. For standard ceilings up to 8 feet, you can install it with or without a down rod and for low ceilings, it should be installed to fit flush to the ceiling. Overall, this Westinghouse ceiling fan is a fantastic option for those who are looking for a ceiling fan that fits smaller rooms. With its lifetime motor warranty and 2-year warranty on all other parts, you can be sure that you are investing in a quality and efficient product. Westinghouse have been manufacturing premium ceiling fans with light kit for many years and they know exactly how to deliver top-notch quality. This 44-inch fan provides highly efficient airflow and the three brushed nickel blades make the Harbor Breeze a stylish addition to any room. It comes with integrated lighting fixture and halogen bulbs that provide the ideal illumination for any room. This ceiling fan should only be installed indoors, and it can be installed on flush mounting which means that it can be attached to the ceiling without down rod. With 4545 CFM airflow capacity, the Harbor Breeze moves the air around the room efficiently. The powerful AC motor can be set to spin the blades in reversed direction for year-round comfort. It comes with a hand-held remote that allows you to operate the reverse-function, three-speed levels and the lights from anywhere in the room. This ceiling fan offers dimmable illumination and the light kit includes one 18-watt LED bulb. Since this is a flush mount unit, it is perfect for low ceiling rooms up to 100 square feet. In conclusion, here is an excellent choice for those who are looking for a quality ceiling fan that offers efficient air flow and cozy illumination. Additionally, there is a lifetime warranty on the motor and 2-year warranty on parts. Next up is a 52-inch ceiling fan from the Brightwatts stable and this is a budget-friendly unit that comes with an elegant white finish light fixture. There is no remote with this unit, but instead, you can operate it using the pull-down chains. However, for an additional fee, you can buy a remote that allows you to operate the fan from anywhere in the room. This ceiling fan comes with a heavy-duty, powerful motor that provides ultra-powerful 5509 CFM airflow and therefore, ideal for large rooms up to 400 square feet. Additionally, there is a switch to reverse the spin direction of the blades for year-round comfort. Out of the box, this fan is known to provide quiet operation and is extremely powerful moving air around big rooms. In comparison to other ceiling fans in this price range, the Brightwatts offer extremely efficient ceiling fan that uses only 17 watts versus 65 watts from other manufacturers. Moreover, the included led lights will brighten the room very well. However, the only negative factor is that there is no dimmable feature. If you decide to purchase a remote with this unit, you will be able to operate both the lights and the speed with the remote. In conclusion, this is a fantastic fan for the price and it comes with a lifetime warranty on the motor. Our next pick is this elegant, ergonomic cage-style ceiling fan that looks like a classy chandelier. It is perfect for smaller rooms like bedrooms or office. Additionally, it comes with a user-friendly remote control that allows you to operate the 3 speed levels and the light fixture. It includes four 40w candelabra light bulbs, measures 23 inches with 3 blades and a 13-15-degree blade pitch. It provides 1360 CFM air flow capacity and is extremely energy efficient, consuming only 36 watts (without lights) which means 38 CFM/Watt airflow efficiency. It is recommended that you hire a professional to install this ceiling fan because it needs to be wired. It comes with 4.5 inches long downrod and can be mounted on high ceilings, low ceilings or standard ceilings. Like every quality brand, the Fanimation ceiling fan comes with a lifetime warranty that makes this a risk-free purchase. If you are looking for a fancy addition to your home, you should consider the Fanimation LP8350LAZ. It is wonderful getting to relax and cool off underneath a quality, neatly designed, and beautifully engineered ceiling fan. However, there are so many fans to choose from with so many bells and whistles that it can be difficult to select the perfect model to fit your style and needs. You can choose anything from a modern style to a traditional style, as well as from a reliable model to a remarkable one. Read our ceiling fan blog to learn more about different things related to ceiling fans. As I mentioned above, there are so many things to take into account when selecting a ceiling fan. But, first of all, you need to figure out what kind of fan you want and need. Your neighbormight be thrilled with his sophisticated modern fan that he just bought, but what might fit one home, might not fit your space. Are you looking for a fan with built-in lights? If you have a high ceiling, you might need a unit that comes with a downrod. If you have a huge room, you need a large fan to for optimal air circulation and if you have a low ceiling, you need a flush mount unit. Some manufacturers make fans that are weatherproof and can be safely operated outdoors in your garden or patio. There are also fans that come with a remote so that you can set the speed level and brightness of the light, or you might want to opt for a pull-down chain to control these features. The point is that there are many things to consider before you fork out your hard-earned cash. I hope this web page will be your last stop before you decide to invest in a ceiling fan and I will do my very best to help you make the smartest choice you possibly can to find the ideal fan for your home or work. I have compiled a few points that will help you to make an informed decision and hopefully you will end up with the perfect ceiling fan for your home. Feel free to browse through this list of ceiling fan considerations and I hope you will get all the answers you need. Lookout for the right size, installation options, number of blades, fans that are designed for outdoor spaces, air flow efficiency, and so on. Here are a couple of crucial factors you should look into before you invest in a ceiling fan. The primary objective of a ceiling fan is to rotate the air and generate steady air flow. In other words, they are designed to move air around efficiently, and for that reason, should keep the room refreshed and prevent the air from becoming stagnant. Another factor to take into account is efficiency. The majority of ceiling fans that are available on the market are extremely energy efficient and reasonably priced. It is very expensive to have the air conditioner on during hot summer days. However, if you use them together, a ceiling fan and an air conditioner, you will be able to cut down your utility bills. Ceiling fans use far less energy than air conditioners and if you use a ceiling fan to circulate the air around the room, you won’t have to use the air conditioner as much if there is also a ceiling fan in the room. Keeping that in mind, ceiling fans are not only environmentally friendly but also a cost-effective solution. Installing a ceiling fan can also ensure that whenever you decide to turn on your air conditioner, you’ll be able to operate it less often and for shorter periods but still rotate cool air around the room. One of the major benefits of owning a ceiling fan is that you will have more cooling (summer) and heating (winter) solutions during seasonal changes. For example, during the early summer period, it is most likely not warm enough to turn on the AC, but a ceiling fan could still serve you well by circulating fresh air around the room. A ceiling fan will not leave your room ice-cold, but they do serve their purpose of rotating fresh air and maintaining a fresh space. The same goes for winter because many of today’s ceiling fans offer a reverse function that will push hot air down and provide you with fresh warm air circulation. By doing this, you won’t have to run your heating system on full power, which helps to reduce your energy bill. Another benefit is the decor aspect; you can choose from millions ceiling fans to decorate your home. There is no doubt that you will find something that fits your decor style and needs with all the options available. These include everything from streamlined and modern to embellished and old-fashioned units. The options are endless, but it is important that you find something that meets your demands. Apart from providing refreshing air around the room and serving as a beautiful decorative item, ceiling fans can also help you with illumination in your desired room/space. You can invest in a fan that comes with a built-in light kit. That way, the fan can bring more light solutions and add more style to any room in your house. There are several options you can choose from when it comes to light kits and fans. The majority of the ceiling fans out there include built-in lights, and there are others that you can attach a light kit to later on. This will all depend on the design and style of the model. In many cases, the light bulbs are below the blades of the fan, and in some cases, the light can be above the blades. If you opt for a fan with built-in light, you will be able to operate the light separately. That is, you don’t have to turn on the fan to turn on the light and you will be able to use both functions together if you want. Overall, operating a fan is very easy and most of the models for sale today include a user-friendly remote or chains that you pull down to control the fan and lights. Also, you will be able to customize the fan to your lighting needs. There are options to adapt the pull chains to set the brightness of the light and dim the light according to your preferences. As you know, ceiling fans are available in a wide array of blade spans. This can range from small blades of 18 inches all the way up to 70 inches and bigger. It is extremely important to choose the right size ceiling fan for your room in order to get the most out of the fan and to make sure it looks good in the room. Ceiling fans are measured by their bladesweep. In other words, once you see the blade form a circle when they are moving, the size is measured from the diameter of the circle. Additionally, it is extremely important to take note of the ceiling height, that is, floor to ceiling height; you will be able to pick from a countless collection of fans regardless of the ceiling height. If you have a very high ceiling, it’s important that you opt for a fan that has a downrod. The downrod is an essential element to suspend the fan further from the ceiling itself unless you want to be jumping around trying to reach the pull-down chains to operate the fan. On the other hand, if you have a room with very limited space and low ceiling, you might want to invest in a low-profile fan that will not hang too low down from the ceiling. There is another important detail that you need to have in mind regarding the size and that is what kind of room/space you intend to install the fan in. It is not a good idea to mount a living room ceiling fan with a large blade diameter in your kitchen. Therefore, the rule of thumb is to choose a small blade diameter ceiling fan for your kitchen and a bigger one for your living room. You need to precisely measure the area to make the best investment and below are some guidelines to help you with your decision. Ceiling fans are not only an awesome way to rotate air around the room but also serve as fantastic decor solutions. There are so many options to choose from with different styles, design, and countless different qualities. Below you will find information about different types of ceiling fans that are available on the market today. Almost all home models feature the hanging propeller style, which is basically a unit that bears a resemblance to a propeller of an airplane that hangs down from the ceiling. Another type of ceiling fan is the so-called directional type that you can adjust to turn at a specific angle. This type is a bit different than the hanging propeller and is ideal if you are looking for a fan that you can move and point to a specific place in the room. The hanging propeller, however, is perfect to ventilate the whole room. The third style is a combination of propeller and directional fan called rotational. This type of fan includes several blade pieces that spin independently on a vertical axis. Here we have the best mounting option for low ceilings of 9 feet or less. With this option, there’s no space between the motor and the ceiling itself. That way, it’s the perfect solution for rooms with lower ceilings. Moreover, there are so many low-profile fans out there that fit low ceilings well and are chock-full of elegant features. Now, if you intend to invest in a ceiling fan for a room with a high ceiling, you should consider adding a downrod. With a downrod, you’ll be able to efficiently extend the fan out from the foundation of the ceiling in your room. You can have an exceptional setup for larger rooms with tall ceilings. The majority of large ceiling fans on the market today do include a downrod mounting, but you should thoroughly verify if the package includes adownrod, because if not, you’ll have to buy one separately. Let’s move on to sloped ceilings. If your ceiling is angled in any way, it would be a good idea to invest in a sloped ceiling adapter. With an adapter, your fan will hang straight and accurately. One thing to note here is that it’s not guaranteed that you’ll be able to use an adapter with all models. There are few items available that include a downrod that you can turn up to a certain degree. The best way is to verify carefully if the fan is compatible with adapters and angled ceilings. To avoid any installation problems, it is a good idea to thoroughly read the specifications provided by the manufacturer because they are not the same for every ceiling fan. You will need to invest in a sloped adapter kit if you purchase a standard mounting fan for your angled ceiling. It is very easy to find out if you need one, or to find out where to buy one because manufacturers generally have all the information and links available on their websites or in the user guides. You might have to invest in extra downrod if you are planning on mounting the fan in a space where the ceiling is highly vaulted. If you need an additional downrod, make sure that it will support and sustain the fan highup in the ceiling. Last but not least, take into account that you can’t modify or adapt some models on a sloped ceiling. Having said that, it is crucial that you make sure that the fan can be mounted on angled ceilings before you invest in one. We have now gone through the mounting options that are available and it’s time to move on to the installation process. The safest way to install a ceiling fan is to consult with a professional to ensure that the fan is correctly installed and will deliver maximum performance. Nevertheless, in case you’re planning to set up the fan by yourself, most, if not all, ceiling fans will include an easy-to-read installation guide. First thing to do before you begin the installation process is to make sure that the electricity is safely turned off. Once you have switched off the power, start focusing on the procedures in the instruction manual on how to securely wire the fan. Next, put together the downrod (if needed. Remember that the downrod is for high ceilings). Then, assemble the light kit (if required), and lastly, install/attach the blades to the fan. Regardless of whether you’re replacing an old fan or just setting up a ceiling fan for the first time, the approach is the same. If you are looking for a way to lower your utility bills, you must look for the Energy Star rating on the fan. Energy Star certified models will bring down your energy bill significantly, and the truth is that they are not more expensive than non-rated models. Energy efficient gadgets are taking the electronics market by a storm nowadays, and ceiling fans are no exception. Fans are gradually increasing in popularity while our energy expenses continue to sky rocket. However, if you live in a place with hot summers or warm weather all year long, it’s crucial that the ceiling fan is efficient. Inefficient units will only cost you money over the long run. Therefore, it is important to look for the Energy Star evaluation, despite the fact that it could cost more. The simple truth is that it will save you a lot of money in energy usage. The only way you can ensure that the model you want to buy is energy efficient is to look for the Energy Star valuation. Only then can you rest assured that the fan will meet all the energy saving demands. As we disused above, our utility bills are increasing and the growing awareness about the environment is forcing the electronics industry to produce more green products that use less energy. It goes without saying that an Energy Star rated ceiling fan will consume much less than a model without the Energy Star stamp. If you want maximum performance from your ceiling fan at lower cost, then you should seriously consider investing in an Energy Star model. However, the truth is that many companies advertise their products as “green” without providing any ceiling fan ratings or certification. Look out for the Energy Star approval. It might have a “green” stamp on it, but is it really an Energy Star rating? The Energy Star rating is a world-recognized stamp that guarantees that the unit has passed a strict evaluation procedure. If it passes these severe tests, the performance is certified to be highly efficient. Energy Star ratings also help potential buyers to pinpoint and buy energy efficient items that are tested to guarantee efficiency and security. Moreover, if you see the Energy Star stamp on your ceiling fan, the unit will come with a minimum 30-year warranty on the motor, two-year lighting warranty, and minimum one-year warranty on parts. The Energy Star logo will provide you with more security and comfort. If you spend an extra minute or two to make sure that the Energy Star label is clearly marked in the product description, you know for sure that the product has passed through rigorous testing. The same goes for the lighting kit. Be on the lookout for a fan that also offers cost effective light equipment. Over the long-term, it will significantly cut down your utility bill, and the bulbs will last much longer and spend less energy. A great number of fans for sale today include some built-in light mechanism while others do not offer any light feature. Moreover, there are some units for sale that include some kind of light kit and bowl that covers the bulb. There should be plenty of light style functions to suit any needs and any room, and lighting styles vary from a simple light bulb to a sophisticated lighting kit that is designed to light up a large room. With all these options available, it can be a daunting task to figure out what could fit your space and style. Initially, you should carefully consider if it is important to invest in a model that includes a light or not. In case you are unsure, you could analyse the room that you intend to install the fan in and determine if you already have sufficient light in that space. You need to consider the natural light, also. Have a quick look at your room and try to figure out if the current light is enough. Try to visualize if you need more table lamps or maybe you have lights in place already in the ceiling, in which case, check if they provide enough light. All these elements are important factors to take into account when you are doing your research and making up your mind about if you need a light kit or not. To better control how much light will be in the room without needing to switch on three different lamps, your best option is probably a fan that comes with a light. Many of the models for sale today include an energy efficient light kit that can light up a large room. Furthermore, today’s models include special features such as a dimmer or a remote so you are in complete charge of the light in the room. If you want to cut down on your utility bill, check the product description for the EnergyStar stamp for BOTH the fan and lighting kit. If you invest in an Energy Star lighting kit as well, you will use less energy and pay less as these types of lighting kits are proven to spend 50% less than a ceiling fan without the Energy Star approval. Take the smart way and help yourself cut down on utility bills. The great thing about these energy efficient kits is that you will not have to waste your time frequently changing light bulbs. Ceiling fans come in all shapes and sizes. They usually include three, four, or five blades. But the question remains, what is the difference between having a ceiling fan with three, four, or five blades? In short, the main difference is visual, and every person has their own taste. One design that you love might not suit your neighbor. It all boils down to personal taste. Evidently, a three-blade ceiling fan will perform differently than a five-blade fan. Therefore, the number of blades does also make a difference to performance. It stands to reason that the number of blades affects the noise level. That is, the more blades, the quieter the fan. This is because of the drag; if you add more blades, the drag on the motor will decrease which means that less air circulates the room. With fewer blades, the motor can operate faster and circulate more air but with more noise. Nowadays, the standard ceiling fan comes out of the factory with either four or five blades because manufacturers claim that it is the perfect balance between efficiency and noise. Blade pitch is also something that you need to consider, and it’s important to know what bladepitch means. The term blade pitch is the angle of the blades when they are parallel to the ground. Blade pitch is extremely important because it determines how much air the fan can circulate and the ideal blade pitch for a ceiling fan is 14 degrees or above. 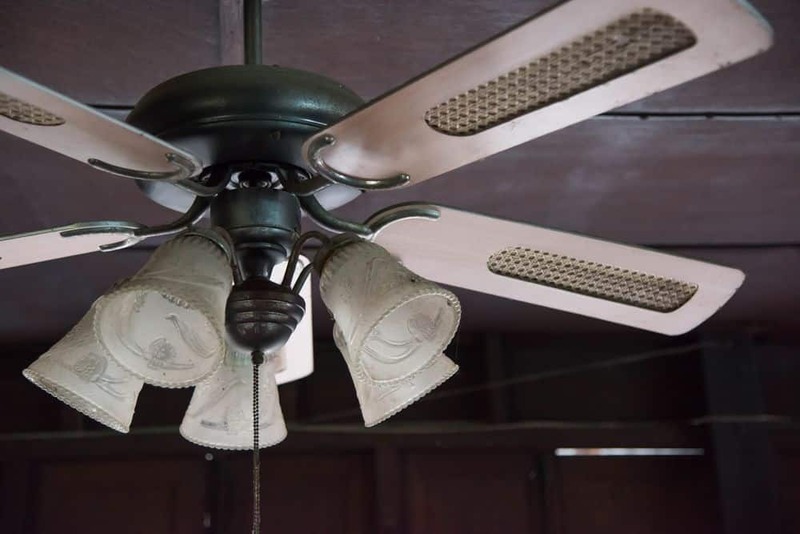 Overall, you’re probably not going to see any significant differences in operational performance between ceiling fans with three or five blades. At the moment, breakthroughs in design and the fact that modern blades produce very low drag are making it possible for ceiling fans that do not fall into the STANDARD BLADE category capable of serving extremely efficiently. The point is that with today’s technology, it doesn’t really matter if you opt for a huge eight-blade ceiling fan or a small two-blade ceiling fan because the fan will do exactly what it says on the tin (circulate air). It all depends on what you are looking for in a ceiling fan and what kinds of bells and whistles you fancy. CFM refers to cubic feet per minute, or simply, airflow. In other words, cubic feet per minute indicates how much air the fan is capable of moving. In order to measure the CFM, the fan needs to be at maximum speed to calculate the amount of air and the movement rate simultaneously. The CFM is determined by a couple of different factors that include the motor, blade pitch, and the length of the blades. If you are looking into CFM numbers, the rule of thumb is the higher the CFM, the more amount of air the fan is capable of rotating. Having said that, the CFM serves a crucial factor in analysing the airflow efficiency. The minimum CFM required to make a fan efficient enough to rotate air is 75. However, you could end up with a model with high CFM that operates at an extremely high wattage. Obviously, a fan with high CFM that runs on high wattage will not be efficient. Therefore, the most logical aspect to look into when you are shopping for a ceiling fan is to make sure that your desired ceiling fan has a high CFM score but uses low wattage. It is relatively easy to find out the CFM and to know if CFM and air efficiency go hand in hand. All the reviews on this website clearly state the CFM and also if the product is Energy Star certified. Therefore, feel free to browse through the products and check the airflow efficiency and power usage for the fan that you are interested in. If you are looking for an easy way to control your fan, your best solution is to buy a remote. Also, if you are planning to buy a remote for your old fan or just looking for a ceiling fan with a remote, it will depend on two factors: your needs and the height of the ceiling in your room. Therefore, if you are looking into installing a unit in a room with a high ceiling or a vaulted ceiling, then a remote is essential. It is more convenient to have a remote control to control the operation of the fan from the palm of your hand instead of getting up and pulling the chains. Even if you don’t have high ceilings, the most popular choice for any room is a unit with a remote. With the remote, you’ll be able to set the speed, brightness, and direction. You’ll find four main remote-control types for sale, and each type has its ups and downs. You can opt for a portable hand remote control. This type of remote allows you to operate the fan from wherever you are in the room. A wall control that you can easily install and operates as a switch. The downside is that you will have to get up to use the control. The combination of portable control and wall control. This is a wall holder that can store a portable remote. The FanSync smartphone solution is basically an app that allows you to control of all the features of the fan through your cell phone. Keep in mind that if you want to add a remote to your current ceiling fan, it might complicate things a bit, and installation is most likely required. Upgrading your old ceiling fan is not a Plug-and-Play process. Usually, you will need to hire someone to install the remote receiver inside the fan. So, you might end up having to remove parts from the ceiling fan, and therefore risk voiding any warranty. On the other hand, depending on your model, it could turn out to be an easy task where you just wire the receiver into the canopy, synchronize the two units, and you are all set. If you live in a place with hot summers or warm weather year-round, a ceiling fan in your patio can work wonders by rotating the warm air around the space. If you are looking for a ceiling fan to mount outside, you need to check if it is built to operate efficiently outside. You cannot just install any fan you like outside because the outdoor types are built to withstand humidity, strong wind, and weather changes. Outdoor fans are getting more and more popular over the years, and they differ in shapes and styles as well. You need to check the product description for the outdoor rating that certifies that the unit is tested to withstand outdoor weather elements. This is called a UL rating, and if the model comes with a UL stamp, you can check how much humidity the fan is tested to withstand. There are other ratings that you need to investigate as well. If you notice any Dry Rating certificate, it means that the unit is not built for outside use and will be destroyed quickly if operated outside. For Damp Rated fans, it is safe to mount them outside as they are designed to resist moisture and humidity. However, they are not going to last long in a rainy or snowy area. This is ideal for patios where you can expect year-round warm weather. If you find a Wet Rated ceiling fan, they are built to tolerate most extreme weather conditions. These are a strongly built unit that feature weather-resistant blades and motor, and they will operate smoothly in rainy and snowy conditions. The bottom line is to understand what the ratings mean and install the ceiling fans in proper locations. Don’t settle for a Dry-Rating model to install outside if you can expect snowy conditions in your area. If you go the extra mile and investigate the ratings, you will end up with a perfect option that fits your needs and style. As strange as it sounds, some ceiling fans are built to withstand the most extreme winter elements. Operating a fan outside during winter does seem strange, but winter and summer fans are designed to heat up or cool down an area. But you might still be wondering how you can benefit from a ceiling fan during winter. The answer lies in the direction of the blades. In outdoor fans, you can change the angle of the blades and control whether they rotate clockwise or counter clockwise. It all depends on the model, and if you are looking for a model that can spin counter clockwise, you need to be on the lookout for a Reverse Mode feature. Again, bear in mind that not all models can support Reverse Mode. During winter and cold seasons, you can use the ceiling fan in conjunction with your heating system, to operate more efficiently. You can reverse the angle of the blades to rotate clockwise. By doing that, the fan will produce an updraft and circulate warm air around the room. The area will then feel much warmer, and the heat will be spread more consistently around the room. If the heat is more evenly spread around the space, you can turn down the thermostat. Now that we have discovered how you should operate your ceiling fan during winter, it’s time to turn the page and see what we can do during summer. To maximize the fan’s performance during summer, the angle of the blades should be set to counterclockwise. Counterclockwise will force the air down and produce a cold airflow around the room. If you use a ceiling fan alongside your thermostat system (during winter or summer), you will be able to lower your electricity bill by15–20%. It’s not enough to understand how to use a ceiling fan in winter or summer. The most important thing is to know where to change the angle of the blades and reverse the motor. To set the angle, all that you have to do is search for a button on the motor or look for the function in the remote control. If you can’t find what you are looking for, refer to the user manual for further instructions on how to locate the angle pitch switch. As you know, they come in all shapes and sizes. You can also get ceiling fans in all price ranges. The price can vary from as low as 30 dollars up to hundreds of dollars. The price range depends on the quality of the model. Read our guide to choosing a ceiling fan based on price. Just like with other electronics, you get what you pay for when it comes to ceiling fans. If you try to save a buck or two here and there, you will most likely end up with a fan that doesn’t fit your space and needs. It is quite easy to spot a top-rated fan and sort them out from the less effective fans. The majority of premium fans will have all the bells and whistles that you won’t find in the cheaper brands. If you are looking for a specific brand our ceiling fan brand guide might be of help. A cheaply built model will not be able to move air as efficiently and quietly as a major brand. With the big shark companies, every part is built with quality in mind and constructed from only top notch materials. Moreover, it will include beautiful design with a neat fixture. The heart and the brain of the fan is the motor, and it needs to be well built. A quality motor features a number of speeds and, in most cases, you are covered with a minimum 10-year warranty. A quality product will include a lifetime warranty on the motor and, therefore, it is important to check the motor warranty. It is highly unlikely you will receive a long warranty on a motor from a 40 dollar unit. We did mention the CFM ratings earlier, and I cannot stress the importance enough of checking the CFM rating of the ceiling fan. The CFM is determined by the efficiency of the ceiling fan — in other words, the amount of air it can circulate in cubic feet per minute. These are ratings that the fan receives based on full speed performance. However, it is important to focus on other attributes as well and not only focus on CFM ratings because CFM is based on globally accepted criteria, and our ceiling fans are not going to be at full speed 24/7, 365 days a year. Having said that, even the most poorly built fans will not receive a high CFM rating. To circulate air around a space depends on length, pitch, number of blades, plus the motor. A poorly constructed motor will be able to spin the blades pretty effectively if the blade features about a 10-degree pitch. However, it will most definitely be a noisy unit while a quality-built fan with 15-degree long blades will be much more effective and silent. The motor is something that you need to investigate thoroughly. The cheap brands will have little or no warranty on their motors, and they are usually made in Asia. These types of motors are not units that you can count on and they are likely stop working shortly after installation or will not function as advertised. These cheap models are not developed with quality in mind, and they tend to wobble at any speed. Make sure that you don’t need to lubricate the motor frequently and make sure that the motor warranty is for at least ten years. If the company is not ready to stand by their product, they don’t deserve your hard-earned cash. At last, look out for certified ratings such as UL ratings, Energy Star, motor warranty, parts warranty, and so on. This is probably the most important point to consider before you make your final decision. Truth be told, once you commit to buy a ceiling fan, you are purchasing something that is supposed to last for many years to come. Keep in mind that if the company is not ready to stand by their product 100%, then how are you supposed to trust that you can use their product for a long time? You can easily spot a durable and reliable ceiling fan just by glancing through the product specifications and checking how long the warranty for the motor and parts are. You should always look for a model that warranties its operation 100%. The motor should be covered for at least 15 years, but the majority of the quality units come with a lifetime motor warranty. Although the motor on your desired unit is “only” covered for 15 years, at least you know that you are covered for quite some time. Therefore, don’t cross off your list fans that include 10–15 year warranties. After reading and analyzing the best ceiling fan reviews, there are many things that you need to think about before you fork out your hard-earned money for a ceiling fan. You need to decide on the design, style, the blade span, size of the room, installation kit, remote, efficiency, ratings, warranty, and many other factors that we have discussed above. These are all crucial factors that will determine what ceiling fan fits your needs and space. It is also good idea to jot down some kind of ceiling fan comparison chart where you can list your options and write down what you are looking for in a fan and then you can narrow your search. Overall, ceiling fans are an excellent remedy to distribute both cool and hot air in a room. However, they are not designed to work as an AC or get rid of humidity. They are developed to create natural and fresh airflow and maintain lasting temperature ranges that can help to regulate a heating system. Just by adding a simple ceiling fan into any room in your house, you will be able to maximize the performance and the lifespan of your heating system and significantly reduce your energy bill.